Ancient capital of England; county town of Hampshire. Jews appear to have settled there at an early date, one of the first entries in the pipe-rolls referring to a fine paid in 1160 by Gentill, a Jewess of Winchester, for the privilege of not marrying a certain Jew. The Jewry seems to have been located in Shorten street, afterward called Jewry street, leading to the North Gate. The synagogue was in Trussil, now Jail, street. The Jewry must have been a center of some importance, as Isaac of Chernigov was found there in 1182 (Jacobs, "Jews of Angevin England," p. 73). It has been conjectured that Moses b. Yom-Ṭob, who wrote the "Darke Niḳḳud" now found in the rabbinic Bibles, lived at Winchester (ib. p. 124). When the massacres occurred in England (1189-1190), Winchester spared its Jews, though a couple of years later the blood accusation was raised against a Winchester Jew (see Richard of Devizes, "Chronicon," ed. Howlett, p. 435). A similar accusation was brought against the Winchester Jews in 1232 (Rigg, "Select Pleas," p. xiv.). In a description of the alleged murder of 1192 Winchester is called "the Jerusalem of the Jews" in those parts, and is stated to have had relations with Jews of France (probably Rouen). The most prominent Jew of Winchester in the eleventh century was probably Deulacresse or Cresselin, who was an agent of Aaron of Lincoln, and who obtained possession of some of the latter's lands after his death. Several Jewesses are mentioned in the records as lending money at Winchester, notably Chera in the twelfth century, and Licorice in the thirteenth (ib. pp. 19-27). An elaborate list of transactions between the latter and Thomas of Charlecote about 1253 shows that Jewesses of those days had the right of holding land as security for payment of debt. Licorice agreed to pay the large fine of £5,000 on succeeding to the estate of her husband, David of Oxford, in 1244 (ib. p. 27, note). 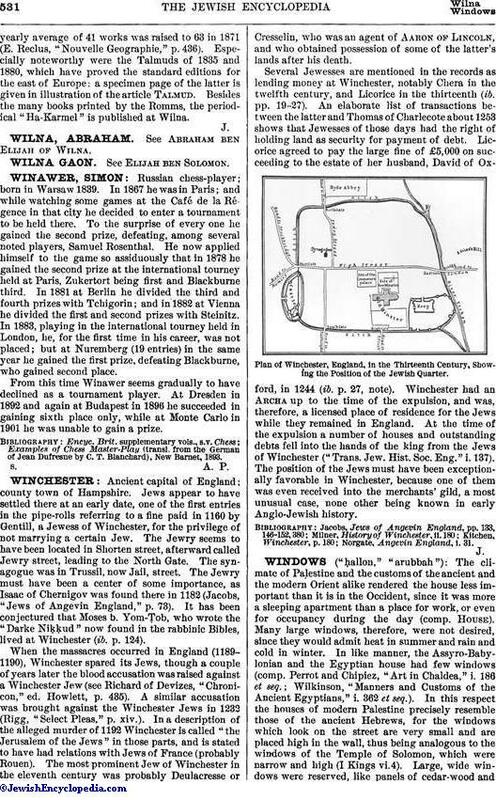 Winchester had an Archa up to the time of the expulsion, and was, therefore, a licensed place of residence for the Jews while they remained in England. At the time of the expulsion a number of houses and outstanding debts fell into the hands of the king from the Jews of Winchester ("Trans. Jew. Hist. Soc. Eng." i. 137). The position of the Jews must have been exceptionally favorable in Winchester, because one of them was even received into the merchants' gild, a most unusual case, none other being known in early Anglo-Jewish history. 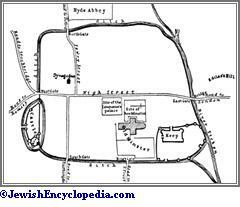 Plan of Winchester, England, in the Thirteenth Century, Showing the Position of the Jewish Quarter. Norgate, Angevin England, i. 31.